Squash (plural squash or squashes) is the common name used for four species in the genus Cucurbita of the gourd family Cucurbitaceae: C. pepo, C. maxima, C. mixta, and C. moschata. These plants, which originated in the Americas, are tendril-bearing plants characterized by hairy stems, unisexual flowers, and a fleshy fruit with a leathery rind that is a type of false berry called a pepo. The name squash also is used for the edible fruit of any of these plants, which can vary considerably in shape, color, and size and is consumed as a vegetable. In North America, squash are loosely grouped into summer squash or winter squash, as well as autumn squash (another name is cheese squash) depending on whether they are harvested as immature fruits (summer squash) or mature fruits (autumn squash or winter squash). Gourds are from the same family as squash. Well known types of squash include the pumpkin and zucchini. Although originating in the Americas, squash are now grown in most countries. While squash tend to be quite nutritious, with high levels of vitamins A and C, niacin, riboflavin, and iron, their attraction to humans extends beyond this to more internal and aesthetic values. Their great variety in colors, color patterns, and shapes—from light green or white to deep yellow, orange, and dark green, from solid to striped, and from flattened to cylindrical to crookneck varieties—combined with their special aroma and taste, offers humans a unique visual and culinary experience. The four species of squash belong to the Cucurbitaceae, a flowering plant family commonly known as gourds or cucurbits and including crops like cucumbers, luffas, melons, and watermelons. The family is predominantly distributed around the tropics, where those with edible fruits were among the earliest cultivated plants in both the Old and New Worlds. The Cucurbitaceae is sometimes known as the gourd family and sometimes as the squash family. 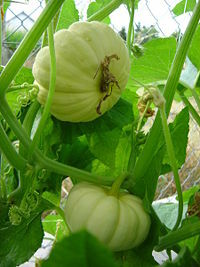 Squashes grow hanging from a network of stalks. Most of the plants in this Cucurbitaceae family are annual vines, but there are also woody lianas, thorny shrubs, and trees (Dendrosicyos). Many species have large, yellow or white flowers. The stems are hairy and pentangular. Tendrils are present at 90 degrees to the leaf petioles at nodes. (In botany, a tendril is a specialized stem, leaf, or petiole with a threadlike shape that is used by climbing plants for support and attachment, generally by twining around whatever it touches.) Leaves are exstipulate, alternate, simple palmately lobed or palmately compound. The flowers are unisexual, with male and female flowers usually on different plants (dioecious), or less common on the same plant (monoecious). The female flowers have inferior ovaries. The fruit is often a kind of berry called a pepo. The pepo, derived from an inferior ovary, is characteristic of the Cucurbitaceae. Squashes generally refer to four species of the genus Cucurbita native to the New World, also called marrows depending on variety or the nationality of the speaker. Archaeological evidence suggests that squash may have been first cultivated in Mesoamerica some 8,000 to 10,000 years ago (Roush 1997; Smith 1997), but may have been independently cultivated elsewhere, albeit later (Smith 2006). 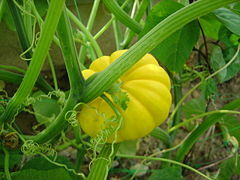 Squash was one of the "Three Sisters" planted by Native Americans. The Three Sisters were the three main indigenous plants used for agriculture: Maize (corn), beans, and squash. These were usually planted together, with the cornstalk providing support for the climbing beans, and shade for the squash. The squash vines provided ground cover to limit weeds. The beans provided nitrogen fixing for all three crops. The English word "squash" derives from askutasquash (literally, "a green thing eaten raw"), a word from the Narragansett language. This was documented by Roger Williams, the founder of Rhode Island, in his 1643 publication A Key Into the Language of America. Similar words for squash exist in related languages of the Algonquian family such as Massachusett. There is great variety in the size, shape, and color of squash fruit, with shapes including flattened and cylindrical forms, and squash with straight and crooked necks. Colors may be white, green, yellow, and with stripes or solid colors. 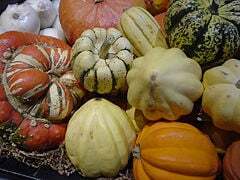 Various squashes such as Turban, Sweet Dumpling, Carnival, Gold Acorn, Delicata, Buttercup and Golden Nugget. Squash is commonly divided into two main categories: Summer squash and winter squash. This is not a biological classification, but rather division on the basis of when the vegetable is harvested—in other words, whether the squash is immature or mature. Both summer and winter squash can be of any of the four species. 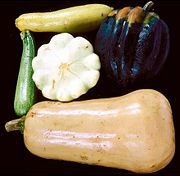 Summer squash is most commonly associated with C. pepo, but winter squash is common among all four species. Summer squash is the category that includes those squash harvested during the growing season, while the skin is still tender and the fruit relatively small. They have soft seeds and thin, edible skins, and tender flesh with a high water content (Herbst 2001). Summer squash is very perishable and may last only five days even when refrigerated in a plastic bag (Herbst 2001). They are consumed almost immediately after harvesting and require little or no cooking. Summer varieties include young vegetable marrows such as zucchini (also known as courgette), pattypan, and yellow crookneck). Four species of the genus Cucurbita are called squash or pumpkins rather indiscriminately. C. maxima includes the large winter squash (such as Hubbard and Banana) and some large pumpkins, and numerous smaller varieties such as Buttercup and Mooregold. On this species the peduncle (fruit stem) is spongy and swollen, not ridged. C. pepo includes the small pie pumpkins, standard field pumpkins, acorn squash, vegetable spaghetti, zucchini, summer crookneck squash, pattypan, and most other summer squashes. While squashes and pumpkins are notorious for producing hybrids when grown within pollinator range of each other; the different species do not naturally hybridize with each other. As with all other members of the family, the flowers come in pollen-bearing male form and the ovary-bearing female form, with both forms being present on the plant. 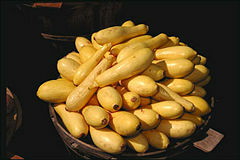 Squash has historically been pollinated by the native North American squash bee Peponapis pruinosa, and related species. However, this bee and its relatives have declined, probably due to pesticide sensitivity, and most commercial plantings are pollinated by European honey bees today. One hive per acre (4,000 m² per hive) is recommended by the United States Department of Agriculture. Gardeners with a shortage of bees often have to hand pollinate. Inadequately pollinated female squash flowers will usually start growing but abort before full development. Many gardeners blame various fungal diseases for the aborted fruit, but the fix proves to be better pollination, not fungicide. Summer squash are high in vitamin A, vitamin C, and niacin and winter squash are a good source of iron, riboflavin, vitamin A, and vitamin C (Herbst 2001). Summer squash are commonly prepared by steaming, baking, deep-frying, and sautéing, and winter squash is commonly prepared by removing the seeds and baking, steaming, or simmering them (Herbst 2001). The squash has been an essential crop in the Andes since the pre-Columbian era. The Moche culture from Northern Peru made ceramics from earth, water, and fire. 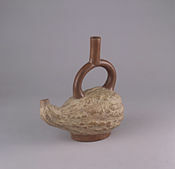 This pottery was a sacred substance, formed in significant shapes and used to represent important themes. Squash are represented frequently in Moche ceramics (Berrin and Larco 1997). Roush, W. 1997. Archaeobiology: Squash seeds yield new view of early American farming. Science 276(5314): 894-895. Retrieved April 12, 2008. Smith, B. D. 1997. The initial domestication of Cucurbita pepo in the Americas 10,000 years ago. Science 276(5314): 932-934. Retrieved April 12, 2008. Smith, B. D. 2006. Eastern North America as an independent center of plant domestication. PNAS 103(33): 12223-12228. Retrieved April 12, 2008. This page was last modified on 22 November 2008, at 00:24.